I thought I would stick my oar in and recommend growing borlotti beans. I struggle to find things that work on my plot and have more failures than successes, but French beans and recently, borlotti beans are my favourite and make me happy! 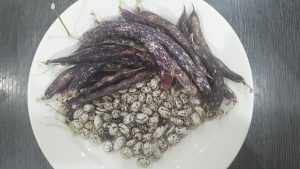 Growing borlotti beans turn into lovely purple pods that start to look dried out at the end of summer and that’s when I pick them. Simmer the beans in water with a bay leaf, rosemary and garlic for about 30 mins, then add salt and let stand for 10 mins. Drain, add some olive oil and lemon juice and eat. They are creamy and tasty and you can eat them in salads, as a side dish or add them to a stew, whatever you fancy. So nice and so easy.